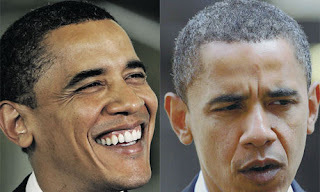 For both presidents and the rest of us, gray hair is simply a part of the normal aging process, and the rate you go silver is genetically predetermined. Going gray is not associated with earlier mortality, and premature graying is not, generally speaking, a sign of a illness or ill health in younger adults. There are, however, some specific health conditions, such as vitiligo (an autoimmune disorder that causes uneven pigmentation) associated with gray or white hair, but for most of us, going gray is just a fact of life. Hair color comes from the pigment melanin, which has two hues, blackish brown and reddish yellow—the amount and mix of each determines your individual shade. Hair without any melanin is pure white. The pigment is produced in cells called melanocytes, located at the base of the hair follicle. The melanocytes inject pigment into the hair. At some point in everyone's lifetime, these cells slow down and eventually stop producing color all together in what's called apoptosis, or genetically predetermined demise. Scientists have yet to identify the exact mechanism by which melanocyte cell death occurs. A study of more than 4,000 women and men from 20 countries determined that about 75% of people between the ages of 45 and 65 have some gray hair. In general, people of European descent gray earliest followed by Asians and Africans. It's interesting to note that a lucky 1 in 10 has no gray hair by retirement age. Beginning at age 30, your chances of having gray hair go up 10-20% per decade. It may feel like you sprout more grays in the wake of a stressful event, but that's probably because middle age is basically a series of anxiety-ridden events. Between working, raising kids, and caring for older parents, the "sandwich" years of 45-65 can be stressful, especially for women. They are also when we naturally start to look older. In 2011, L'Oreal announced it was in the early stages of developing a pill that would prevent melanin reduction, but at this point, there is still no silver bullet to keep away the grays.